, bishop of Rochester, the eldest of three sons of the rev. John Tnomas, many years vicar of Brampton in Cumberland, was born at Carlisle Oct. 14, 1712. Many of his ancestors, both on the paternal and | maternal side, were remarkable for their longevity; so that he might be considered as “born with somewhat like an hereditary claim to length of days.” Being designed for the church, at a proper age he was placed in the grammar-school at Carlisle, whence he was sent to Oxford, in 1730, and, on the 23d of November, was admitted a commoner of Queen’s-college. Soon after his admission he had a clerkship given him by Dr. Smith, then provost. Having discharged this office, and completed his terms, he put on a civilian’s gown, and, leaving Oxford, became an assistant at the classical academy in Soho-square. In this situation he acquitted himself so well, as to be recommended to be private tutor to the younger son of sir William Clayton, bart. a charge which led to his future elevation. How long he remained in it, is not precisely known, but probably till he had completed his pupil’s education. His conduct, however, was so well approved, that shortly after, with the consent of sir William Clayton, the sister of his pupil, on the death of her first husband, sir Charles Blackwell, of Sprowston-hall, Norfolk, became his wife. Mr. Thomas lived in habits of the closest friendship with his brother-in-law, until about 1784, when that gentleman met a premature death, occasioned by a fall from his horse. 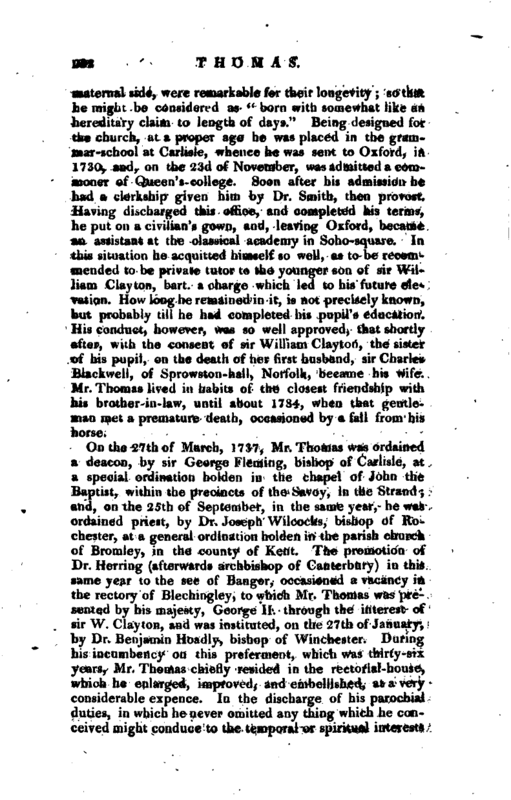 On the 27th of March, 1737, Mr. Thomas was ordained a deacon, by sir George Fleming, bishop of Carlisle, at a special ordination holden in the chapel of John the Baptist, within the precincts of the Savoy, in the Strand; and, on the 25th of September, in the same year, he was ordained priest, by Dr. Joseph Wilcocks, bishop of Rochester, at a general ordination holden in the parish church of Bromley, in the county of Kent. The promotion of Dr Herring (afterwards archbishop of Canterbury) in this same year to the see of Bangor, occasioned a vacancy in the rectory of Blechingley, to which Mr. Thomas was presented by his majesty, George II. through the interest of sir W. Clayton, and was instituted, on the 27th of January, by Dr. Benjamin Hoadly, bishop of Winchester. During his incumbency on this preferment, which was thirty-six years, Mr. Thomas chiefly resided in the rectorial-house, which he enlarged, improved, and embellished, at a very considerable ex pence. In the discharge of his parochial duties, in which he never omitted any thing which he conceived inight conduce to the temporal or spiritual interests | of his parishioners, he was for some time assisted by his brother; and, after his promotion to a vicarage in Norfolk, by the rev. William Thompson, the poet. On the 25th of May, 1742, Mr. Thomas took the degree of D. C. L.; in the year following his marriage took place; on the 18th of January, 1748, he was appointed chaplain in ordinary to his late majesty, George II. 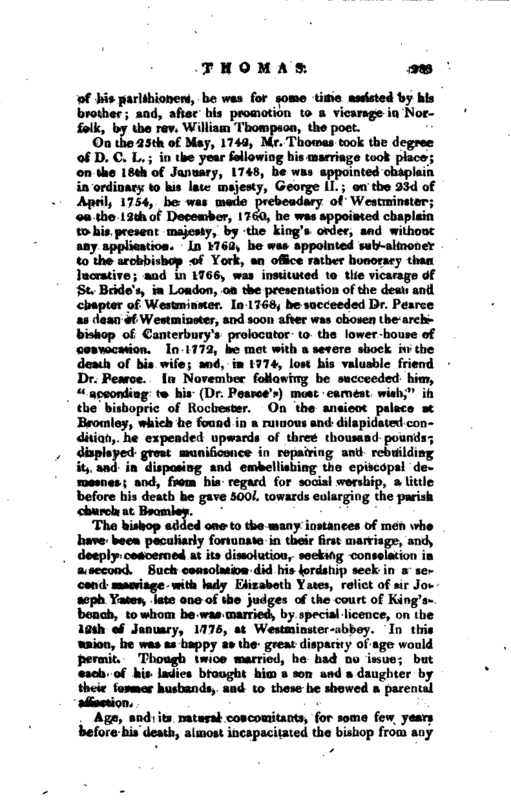 ; on the 23d of April, 1754, he was made prebendary of Westminster; on the 12th of December, 1760, he was appointed chaplain to his present majesty, by the king’s order, and without any application. ID 1762, he was appointed sub-almoner to the archbishop of York, an office rather honorary than lucrative; and in 1766, was instituted to the vicarage of St. Bride’s, in London, on the presentation of the dean and chapter of Westminster. In 1768, he succeeded Dr. Pearce as dean of Westminster, and soon after was chosen the archbishop of Canterbury’s prolocutor to the lower house of convocation. 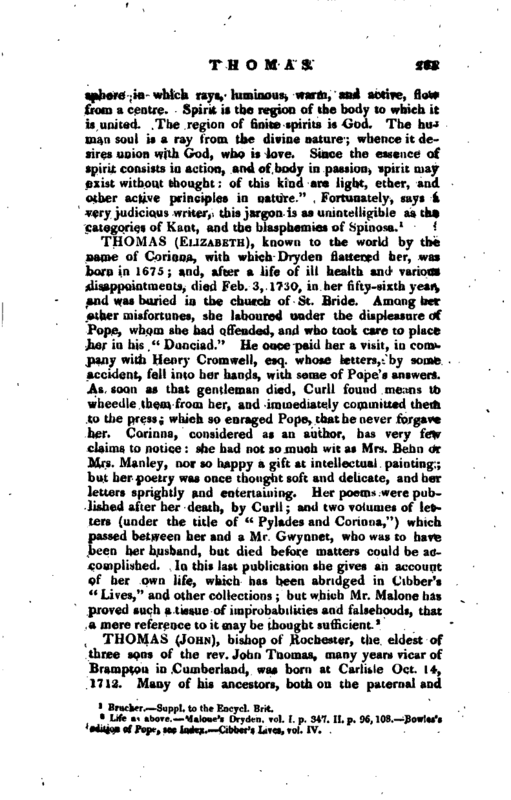 In 1772, he met with a severe shock in the death of his wife; and, in 1774, lost his valuable fr.tt,d Dr. Pearce. In November following he succeeded him, “according to his (Dr. Pearce’s) most earnest wish,” in the bishopric of Rochester. On the ancient palace at Bromley, which he found in a ruinous and dilapidated condition, he expended upwards of three thousand pounds; displayed great munificence in repairing and rebuilding it, and in disposing and embellishing the episcopal demesnes; and, from his regard for social worship, a little before his death he gave 5OO/. towards enlarging the parish church at Bromley. The bishop added one to the many instances of men who have been peculiarly fortunate in their first marriage, and, deeply concerned at its dissolution, seeking consolation in a second. Such consolation did his lordship seek in a second marriage with lady Elizabeth Yates, relict of sir Joseph Yates, late one of the judges of the court of King’sbench, to whom he was married, by special licence, on the 12th of January, 1775, at Westminster-abbey. In this union, he was as happy as the great disparity of age" would permit. Though twice married, he had no issue; but each of his ladies brought him a son and a daughter by their former husbands, and to these he shewed a parental affection. 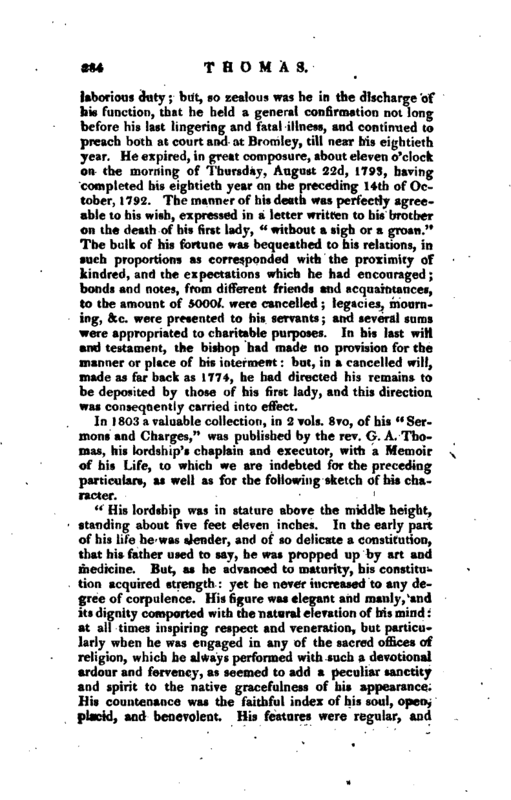 Age, and its natural concomitants, for some few years before his death, almost incapacitated the bishop from any | laborious duty; but, so zealous was he in the discharge of his function, that he held a general confirmation not long before his last lingering and fatal illness, and continued to preach both at court and at Bromley, till near his eightieth year. He expired, in great composure, about eleven o’clock on the morning of Thursday, August 22d, 1793, having completed his eightieth year on the preceding 14th of October, 1792. The manner of his death was perfectly agreeable to his wish, expressed in a letter written to his brother on the death of his first lady, “without a sigh or a groan.” The bjlk of his fortune was bequeathed to his relations, in such proportions as corresponded with the proximity of kindred, and the expectations which he had encouraged; bonds and notes, from different friends and acquaintances, to the amount of 5000l. were cancelled legacies, mourning, &c. were presented to his servants and several sums were appropriated to charitable purposes. In his last will and testament, the bishop had made no provision for the manner or place of his interment: but, in a cancelled will, made as far back as 1774, he had directed his remains to be deposited by those of his first lady, and this direction was consequently carried into effect. In 1803 a valuable collection, in 2 vols. 8vo, of his “Sermons and Charges,” was published by the rev. 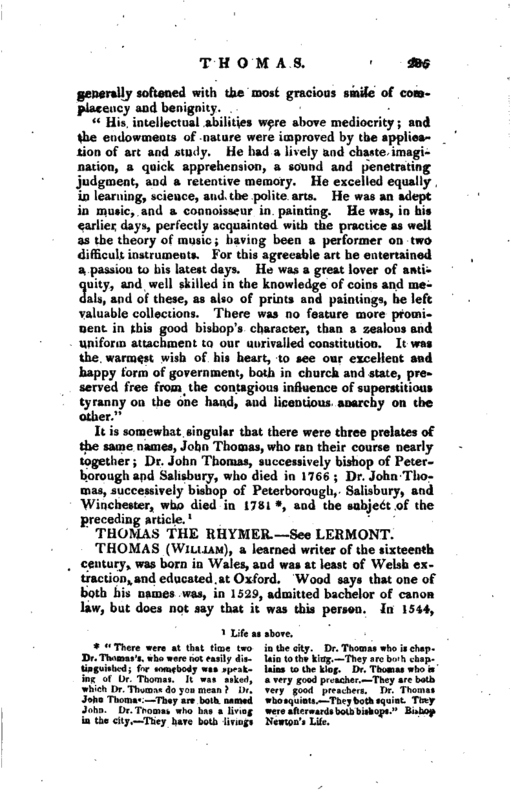 G. A. Thomas, his lordship’s chaplain and executor, with a Memoir of his Life, to which we are indebted for the preceding particulars, as well as for the following sketch of his character. "His lordship was in stature above the middle height, standing about five feet eleven inches. In the early part of his life he was slender, and of Bo delicate a constitution, that his father used to say, he was propped up by art and medicine. But, as he advanced to maturity, his constitution acquired strength: yet he never increased to any degree of corpulence. His figure was elegant and manly, and its dignity comported with the natural elevation of his mind: at all times inspiring respect and veneration, but particularly when he was engaged in any of the sacred offices of religion, which he always performed with such a devotional ardour and fervency, as seemed to add a peculiar sanctity and spirit to the native gracefulness of his appearance. His countenance was the faithful index of his soul, open, placid, and benevolent. His features were regular, and | generally softened with the most gracious smile of complacency and benignity. “There were at that time two Dr. Thomas’s, who were not easily distinguished; for somebody was speaking of Dr. Thomas. It was asked, which Dr. Thomas do yon mean? Dr. John Thomas.— They are both named John. Dr. Thomas who his a living in the city.—They have both livings in the city. Dr. Thomas who is chaplain to the king.—They are both chaplains to the king. Dr. Thomas who is a very good preacher.—They are both very good preachers. Dr. Thomas who squints.—They both squint. They were afterwards both bishops.” Bishop Newton’s Life. and the subject of the preceding article.